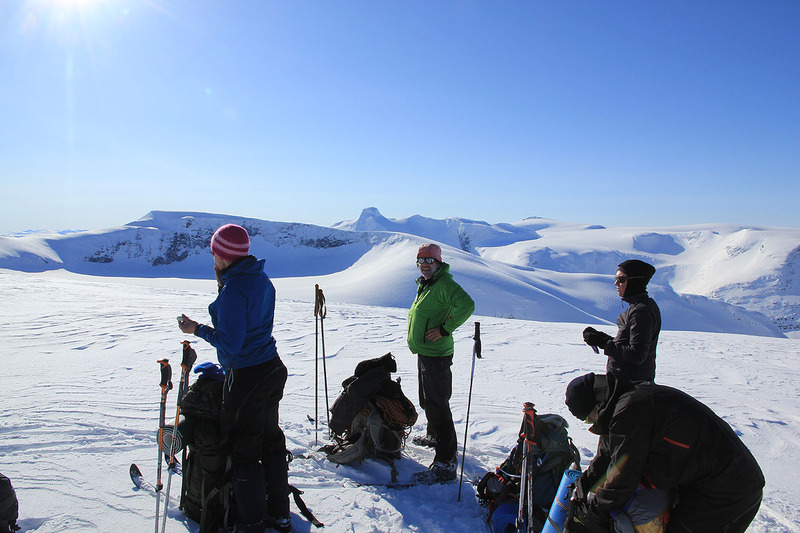 How to get there: This is a place that one naturally may visit on a ski trip from Skåla to Lodalskåpa. See these mountains for additional information. 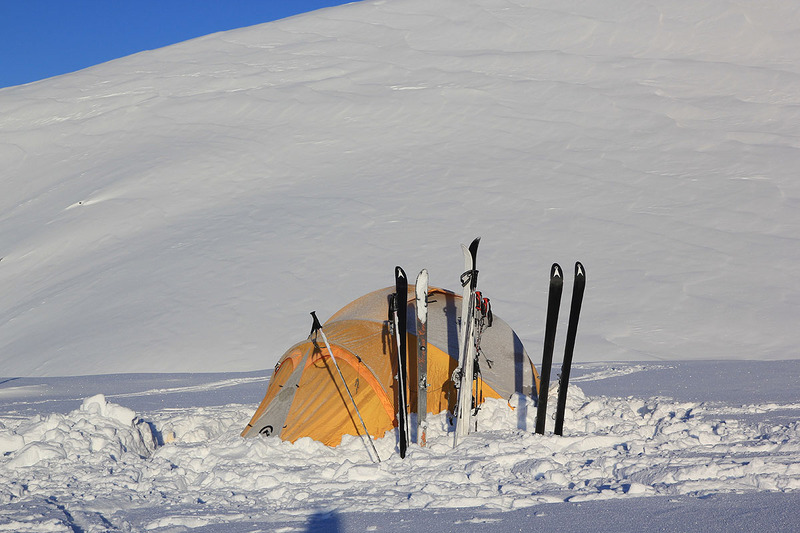 Route description: After having passed Bings Brekuppel (in a traverse or via its top), the normal skiing route will climb the glacier near point 1814. Keeping a bit more to the left and gaining a few meters more than absolutely neccesary will bring you to this point. 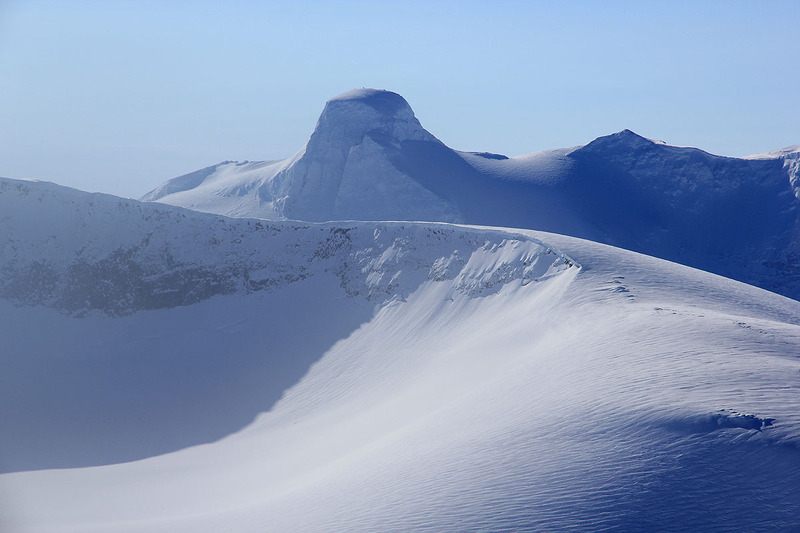 The highest point is essentially where the glacier ends on top of a huge cliff with significant cornices. Extreme caution must be shown when skiing near this high point as the snow quite regularly will break of in large pieces that subsequently avalanches down the slope below. The route is as desribed above. 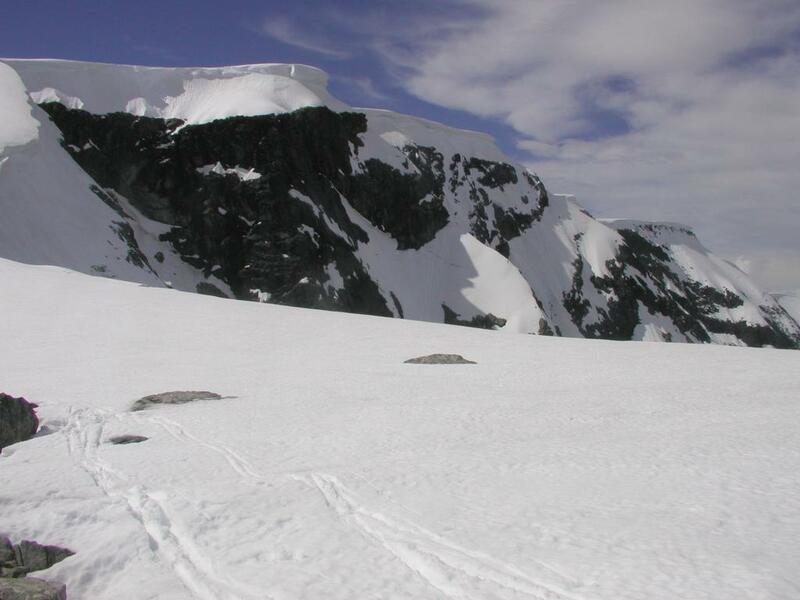 One should ascend the ridge, and unless you want to visit this point, traverse on the right hand side and descend down to the saddle connecting this mountain with Tomefjellet further along. 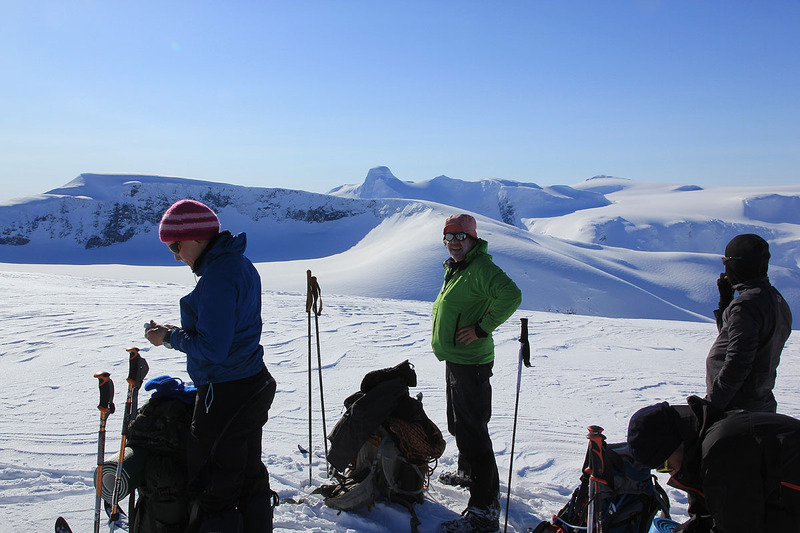 As you get onto the broad ridge, Lodalskåpa comes into view. My team decided that a break was required in order to fully appreciate the view. 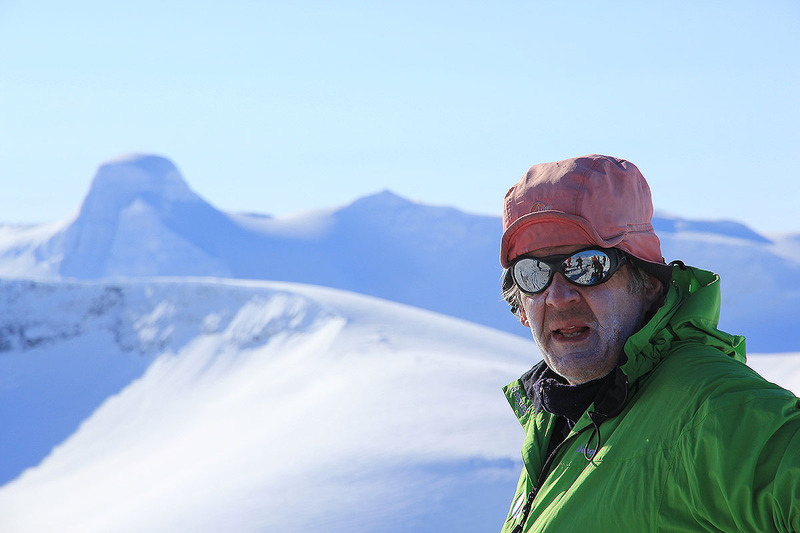 The route continues to Skålefjellet. Comments: Normally, one would ski to the right of point 1814 and contour around the distinct ridge at about this elevation. 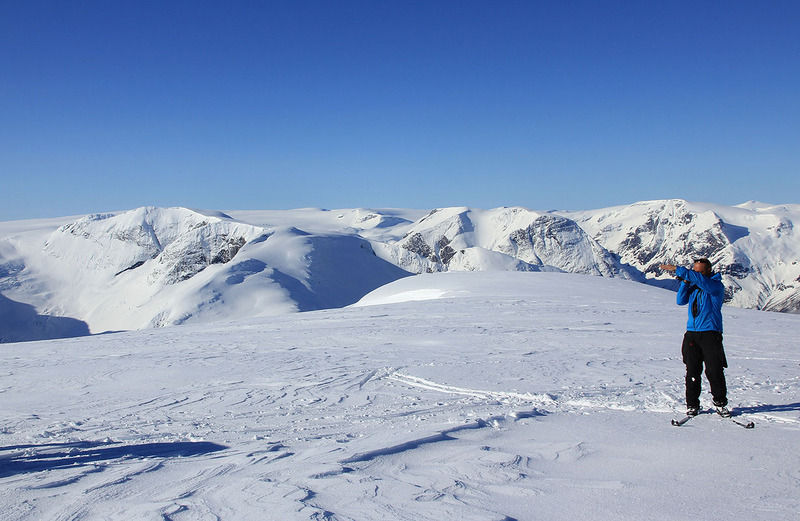 I have however, at least one time skied to the very highest point for subsequently to ski down, using caution along the way and stay respectfully away from the cliffs. 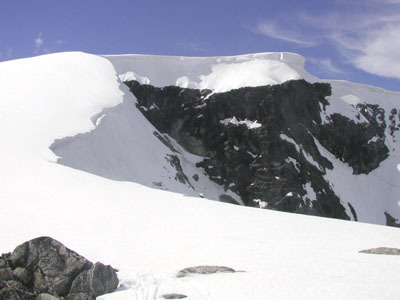 The high point of Tindefjellbreen, as seen from the saddle leading further towards the 1925 meter mountain along the route from Skåla to Lodalskåpa. Tindefjellene and part of the route to Bing. View ahead. Our route follows the leftmost ridge.